Presentation: Current indications for drug-eluting stents. Presentation: Risk stratification and coronary heart disease. 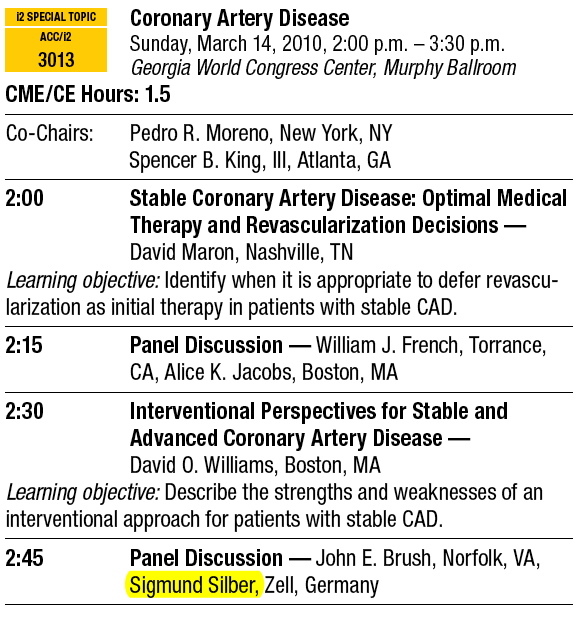 Presentation: When to re(re-)revascularize or have the COURAGE to defer another angio? Are the ACCF /SCAI/STS/ AAlS/ AHA/ ASNC 2009 appropriateness criteria for revascularization applicable to European practice for chronic stable angina? Presentation: How to choose DES in DM? Presentation: Pros and cons of thrombectomy devices in STEMI. Presentation: Can PCI exceed bypass surgery? Presentation: Value of Cardiac CT in Addition to Myocardial Perfusion Szintigraphy. Presentation: Risk stratification and coronary artery disease. Presentation: Do we need to update the guidelines? Presentation: Different DES in complex lesions - are the clinical results still the same? Presentation: Are all DES the same?